A frequently asked question is if tensiles are suitable for windy sites. The answer is yes as long as the canopy is properly engineered. In the computer analysis of the different load cases wind uplift is usually as great as the live snow load. A factor of safety between 4 and 6 is then used to select the fabric weight. The detailing of the fittings and surrounding structure needs to take into account the maximum deflections of the membrane. Boundary details need to accommodate the oscillations that may be generated at the canopy extremities. Our conical canopy in Mauritius is 32m in diameter and is designed for and had regularly experienced 150 mph winds. In these extreme circumstances an annual re-tension/maintenance check is recommended. Designing for heavy snow loads requires more care as you have greater risk of melt water ponding. The profiles would generally need to be steeper and spans smaller. PVC fabrics incorporate UV stabilisers which protect colour fastness and base cloth slowing the rate of degradation, however in high UV lifespan will be reduced. After 20 years the PVC will lose its flexibility and will become more brittle. In areas of high humidity regular cleaning will reduce the risk of mould growth on the surface of the fabric causing permanent staining. For design life over 10 years in areas of high UV, pollution or humidity, PTFE/glass becomes a better option. The fire performance of a membrane depends on the basecloth and the seam details. All membranes will de-tension under high temperatures. The speed will start peeling apart at around 100. At 250c the PVC membrane will melt back from the heat source creating vent holes for heat and smoke. PVC has fire retardants in the coating so that if self extinguishes when the flame source is removed and therefore would not produce flaming droplets. With PTFE fabric the glass base cloth withstands temperatures up to 1000c and the openings are limited to failed seams which would part at approx 270c. The net effect in a fire can be quite beneficial as most canopy designs form a smoke reservoir which may well allow sufficient time for escape, and when sufficiently hot self venting will occur through a failed seam. Critical steelwork should be supported so that partial failure of a damaged roof will not cause collapse of the structure. The design should consider smoke generated by the membrane used. PTFE fabric used internally may require sprinkler systems or mechanical extraction to reduce toxic fume production at temperatures over 400c. As you would expect in some cold weather conditions condensation is likely to occur with roofs covering a sealed heated space. The design of the roof gradients and edge detailing can minimise any problems. Ventilation can obviously reduce the risk but if more control is required then it would be necessary to incorporate a second skin and possibly additional thermal quilt. Control of the air flow in the air gap is recommended to get the best environmental control. A sealed gap is best in winter for insulation and good air flow in the summer will help cooling. The design of roofs especially conic forms can make use of the passive stack effect ventilation with fans or louvres used to enhance the performance if required. A single fabric membrane is virtually transparent to low frequency sound due to its low mass. A double skin with an acoustic quilt interlayer will give you the absorption figures required. Reverberation times on the other hand can be very successfully reduced with tensile fabric linings with acoustic quilt behind wither wall mounted or hung on drop wires. Unlike glass or brittle panels fabric is highly resistant to impact damage from blunt objects. It is however susceptible to sharp objects. Small cuts can be repaired with glue-on patches. Larger tears may need specialist repair with portable hot air welders. If an invisible repair is required then the membrane may need to be removed and a replacement panel inserted in the factory. Graffiti solvents may damage the PVC lacquers so should be avoided. PTFE fabrics are highly resistant to abuse as paints wont key to the surface. The sensible solution is to design out the problem as much as possible but putting the fabric out of reach and details the masts accordingly to minimise the risk of climbing. In vulnerable areas a modular canopy with slide out panels may be a sensible precaution to minimise replacement costs. Some structures such as public bus stops in very exposed sites are probably not ideally suited for membranes. 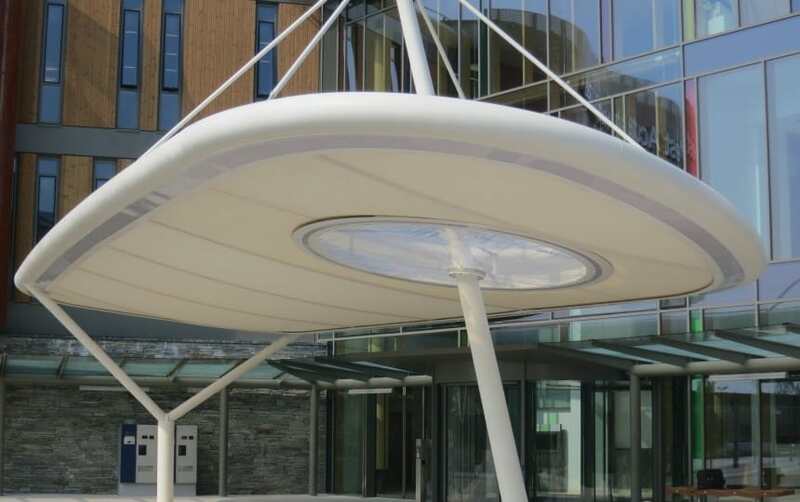 Advantages over overhead glass canopies are that thrown objects tend to bounce off a fabric canopy and health and safety issue of falling glass is largely resolved. For the smaller structures this is done with long handled brushes and soapy water if necessary from cherry pickers or tower scaffolds. With the larger membranes trained rope access riggers abseil from high level anchorage points or traverse across the membrane with a Latchway or similar restraint system using brushes and water filled back packs or pressure washers. Every structure has its own maintenance manual describing fixing points and cleaning procedures. Ideally canopies should be cleaned annually but PTFE/glass fabric would be the preferred option if cleaning is unlikely or impractical. This is because its inherent no-stick surface resists pollutant adhesion and allows rain to clean off most dirt. Raw PVC is readily adhered to by pollutants so all membranes are treated with dirt resistant lacquers or surface foils. Careful cleaning maintains their life and the optimum appearance of the membrane. The fabric manufacturer can issue a 5 year up to a 10 year warranty covering the structural strength and integrity of the fabric. The specialist subcontractor can be asked for a collateral design warranty. We recommend that structures have annual inspections to ensure the ongoing integrity of each critical component. As a Senior Designer, Ceri designs some of the world's most complex tensile fabric structures.